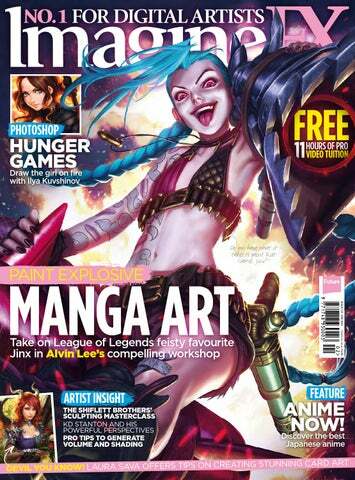 Do you have what it takes to paint Riot Games’ Jinx?! At the core of the Digital art community Jana Schirmer posted about her artistic frustrations on Facebook. She tells us that she now prefers painting more graphic-looking images, like this recent artwork. Canada’s Syn Studio is offering an industrystandard concept art diploma, taught by top-name artists, including Remko Troost and Donglu Yu. Self-taught Chilean artist Genzoman shows you around his new self-designed studio, surrounded by figurines, art books and his very first drawing. Concept design veteran Matt Gaser’s first self-published book, Fantastical, collects a decade’s worth of fantasy artwork from films and video games. “I needed to find the fun again,” says Jana. First Fire: Guardian of the Eastern Door is based on a prophesy of Winona Nelson’s tribe, the Ojibwe, that foretold the coming of the Pale People.(3bn). get your resources See page 6 now! Struggling with a painting technique or topic? 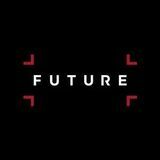 Email help@imaginefx.com today! There are many ways to get creative with your subversions. I avoid the predictable evil ‘black’ unicorn and instead choose a muted, rusty colour scheme for my beast. Email help@imaginefx.com with your art questions and we’ll provide all the answers! Use a Color Dodge layer to paint highlights with a gritty, textured brush. Be sure to first double-click the layer and then deselect Transparency Shapes Layer. Can you see the difference? to write out a fantasy bestiary, and categorise them into good, evil and neutral. After that it becomes pretty easy to choose which subject you want to depict against type. Colour and lighting can strongly support your narrative as well as the tone of your piece. Want to paint a typically evil creature as friendly or cute? Use bright, saturated colours. Warm lighting and cool shadows works well for this. Looking for ways to make a good character look evil or foreboding? Try featuring some desaturated colours and gritty textures. I block in some of my evil unicorn’s form in a rough sketch. Typically, unicorns are shown as standing around looking pretty and serene, so I give my subject a more dynamic, charging pose. Reference will always help you out when deciding upon a pose or gesture. I tend to use Flickr and Pinterest, or I shoot my own. When detailing your subject, think 3 about your choices when it comes to iconic or recognisable elements of it’s design. For this unicorn’s horn. I look up some reference for different types of animal horns, and chose one that’s less streamlined, jagged, and perhaps a little more fit for impaling a gnome or two. Take your original sketch and do several colour comps to see which palette fits the mood. Don’t limit yourself! Overlay is also a wonderful adjustment layer to quickly assign one colour to light values and another colour to dark. The problems with using bright, saturated colours usually arise when you overuse them. But it really depends on the painting and what you’re trying to convey. But if you can pull it off, a “garish” palette isn’t garish at all. “One monk versus bandits in the market!” An older work completed for Perfect World’s Swordsman Online. to life in the game world for real. We’re very lucky to have such a skilled group of artists to work with.” The team’s responsibilities extend beyond concept work, too, and into furnishing the game environment with additional fidelity. Some of the in-game textures in the environment are down to Tom’s squad, along with the fictional film posters, graffiti and other 2D artwork that decorate the game’s stricken near-future setting. It’s an approach that requires discipline and creativity. The Division’s dilapidated, mid-crisis Manhattan is bleakly beautiful, the society brought to its knees by a viral outbreak is both poignant and jarring. Ubisoft Massive The Division’s beleaguered urban environment has allowed plenty of opportunity to combine rusty metal, chipped brickwork and dirty glass. This imposing entrance to an unfinished tube line and station captures the blend of familiarity and threatening uncertainty that characterises The Division. So what is it really like working at Ubisoft Massive? Super exciting. The stuff we work on is entertaining, interesting and challenging. From day one at the company I felt that the department leads and directors have trusted me and my abilities, and that is really encouraging. Which projects have you worked on so far? Only on Tom Clancy’s The Division so far. I joined Ubisoft Massive last year and it’s the first commercial title I’ve worked on. Are you afforded a lot of artistic freedom when it comes to your work there? It depends a lot on what kind of game you’re making at the time and what part you’re designing. There are some obvious guidelines and rules that you always have to account for when designing for a real-world setting in video games. Nonetheless, I still feel that I have a lot of artistic freedom in my work, especially in how I go about developing designs and what visual cues I choose to put in them to communicate a story. How did you find the process of joining the company? Very enlightening and very productive. I’ve gotten so much out of having a steady platform where I can paint and design all day, together with a bunch of like-minded people. You learn so much as an artist from just having access to that. For the first half of my internship I had Titus Lunter as my mentor and he taught me some very valuable key points for how to think like a concept artist. Many thanks again Titus! A playable character brought to life. Characters are customisable, so plenty of clothing, accessories and weapons were created. And what kind of benefits are on offer for Massive employees? I actually met some of Massive’s concept artists for the first time at a sketch meeting here in Malmö when I had just started out learning the craft. Currently we’re mostly just hard at work, but Tom Garden, the lead concept artist, is always hunting down workshops and courses for us to attend. What makes Massive’s art department special in your eyes? We are people from all around the world and are therefore diverse in our tastes and styles. And yet we have a very friendly and playful atmosphere and I’ve learned so much from being in this environment, even beyond concept art and game development. always mean a cold or sad mood, yellow doesn’t always mean joy and fun. In the context of a story, sometimes a warm palette can add a sense of mystery. In this workshop I’ll draw a pale girl with very blonde hair in a white dress on a light background, and I’m going to show you how to achieve volume at low contrast. We’ll end up with a very gentle and rather mysterious effect. I’ll also show you how to colour a black and white picture using gradient maps. Use Camera Raw filters This filter, present in Photoshop CC, isn’t only for photographers. Go to Filters>Camera Raw filter and play with the temperature, tint and vibrance. Sometimes you need a fresh view on your picture, and by using this filter you can develop interesting colour schemes for your composition. It’s important not to use pure black or white, because this may distort the perception of depth and volume. After all, black shadows don’t exist in real life. With this in mind, I change the colour of the background from white to grey, then create a new layer for sketching and use a dark grey. This produces a very low contrast, making it easier to visualise my idea. I need to determine the light source early on in my painting process, so I use a large Soft brush to identify the main spots of light and shadow. Then I take the Hard brush and paint in some drop shadows. At this stage there’s no need to detail individual elements of the image. ven though I started dabbling into fantasy art as a teen, for a long time I never thought of it as any more than a hobby. The first decisive step on the illustration path was getting a Wacom tablet, and switching to digital eventually proved to be a game changer for me, because it solved both the issue of speed and the high cost of art materials. the verticals are emphasised. I prefer static compositions, but they can be a bit dull for fantasy themes. As a compromise, I use softer diagonal shapes as accents in the foreground. For example, placing objects such as flowing fabric here and there helps to break up the monotony and develops a pleasing contrast with the background. principles I picked up in school, personal observations and advices I found online. I’m currently illustrating cards for Applibot’s Legend of the Cryptids, a fantasy game for smartphones, so I’m going to use images I created for the company to show how I apply this information in practice and, hopefully, provide some useful insight for those who are interested in producing similar work. 2 When to use symmetry There’s a time and a place to use bilaterally symmetrical layouts. Indeed, I’d go so far as to say that this type of composition should be used sparingly, but it’s certainly effective in appropriate contexts. Its visual impact is high because all lines converge and the eye is drawn towards the centre, so illustrated subject matter such as book covers or film posters can benefit from it. Symmetrical poses can make a character look regal, powerful or heroic. They usually work especially well with characters who have wings and mythological beings in general, because they remind the viewer of iconic representations. When in doubt, use reference. That doesn’t mean copying a photo as it is, but studying one or more images to figure out how something looks or works. If you need to use precise reference, there are plenty of sites with legal free photos – my favourite source is www.morguefile.com. This goes back to ancient Greek art and is considered ideal for depicting the human figure. The body should be positioned in a way that describes an S-shaped line, so that the shoulders and the hips are angled differently. The most basic pose that uses this principle is contrapposto, where the figure rests all its weight on one leg. In illustration, this formula can be taken even further, and curves and proportions can be exaggerated or stylised according to your own painting method. Sculpt, which is a two-part modelling compound that cures when mixed together into a very dense and high-grade sculpting material. It hardens between two and three hours after you’ve mixed it together. It can be carved, drilled and sanded, and it stays crisp.